The Disposable Oxygen Simple Face Mask is a basic disposable mask, made of clear plastic, to provide oxygen therapy for patients who are experiencing conditions such as chest pain (possible heart attacks), dizziness, and minor hemorrhages. This mask is only meant for patients who are able to breathe on their own, but who may require a higher oxygen concentration than the 21% concentration found in ambient air. 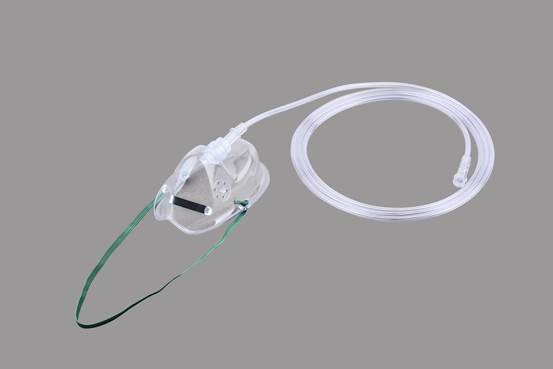 The Disposable Oxygen Simple Face Mask is a basic disposable mask, made of clear plastic, to provide oxygen therapy for patients who are experiencing conditions such as chest pain (possible heart attacks), dizziness, and minor hemorrhages. This mask is only meant for patients who are able to breathe on their own, but who may require a higher oxygen concentration than the 21% concentration found in ambient air. We are committed to providing the best Disposable Oxygen Simple Face Mask and the best services to customers. For us, customer's satisfaction is our top priority. We are willing to listen to all the feedbacks and comments. 1.Made of medical grade PVC. 2.Sterilized by EO gas is available for choice. 3.Transparent and soft vinyl for patients' comfort. 4.Adjustable nose clip can be adjusted according to the face shape assures comfortable fit .